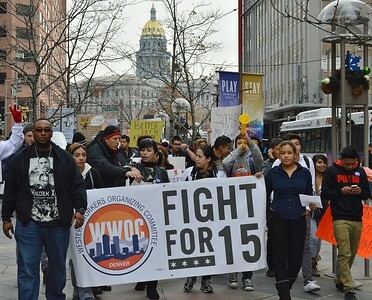 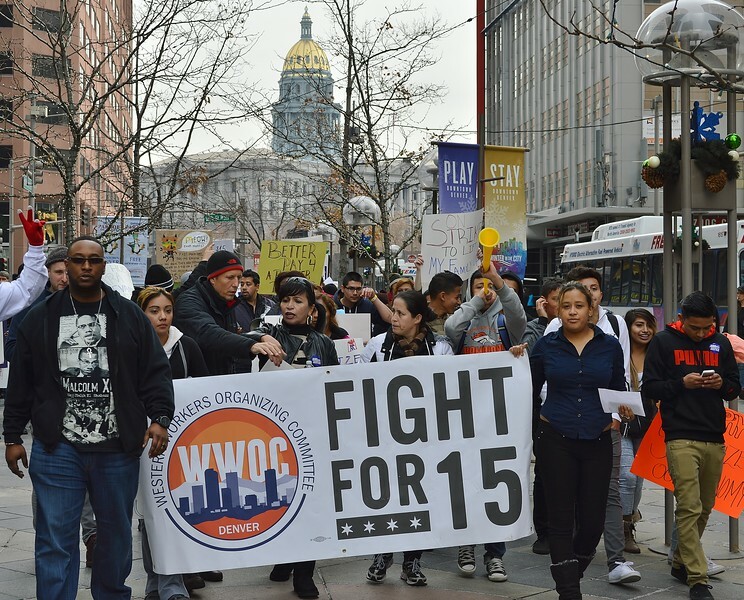 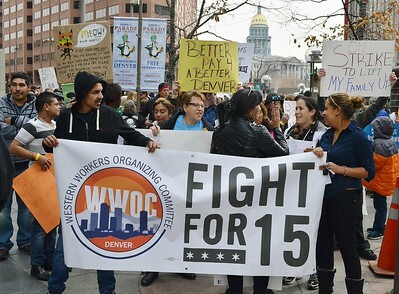 Group of demonstrators standing behind sign "Fight For $15", Colorado capitol building in the background. 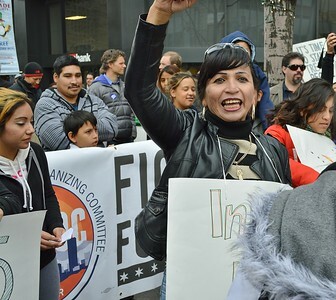 Hispanic woman raises hand in air and smiles, other demonstrators behind her. 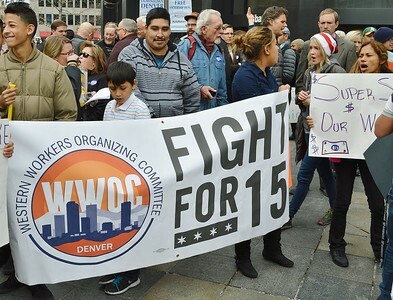 Group of protesters standing behind banner that reads "Fight For $15. 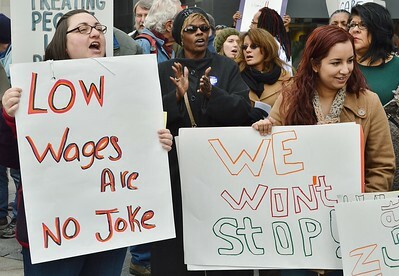 Woman holding sign about low wages shouts, next to her woman with sign "We won't stop", behind them African American woman claps, more demonstrators in the background. 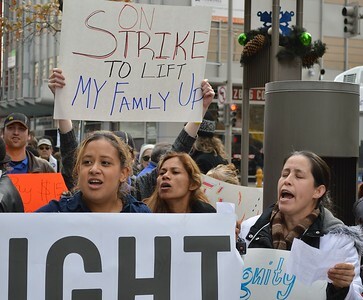 Three woman holding protest signs and shouting, behind them a sign "On Strike To Lift Up My Family". 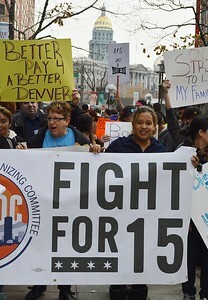 Three women carry banner "Fight For $15" other protesters march behind them. 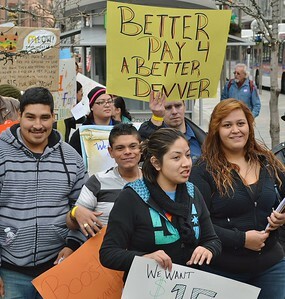 Group of young men and women marching, behind them sign about better pay. 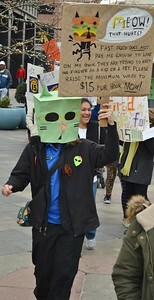 Man marching with cat mask made from bag on his head, carries sign about low pay for fast food workers. 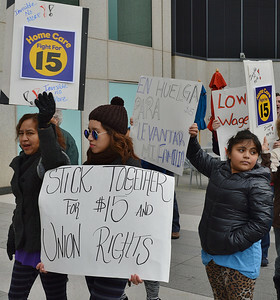 Young girl holds sign in Spanish, in fron of her two women march with signs about unions and $15/hr pay. 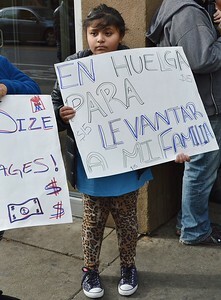 Young hispanic child holding sign in Spanish about better wages for fast food workers. 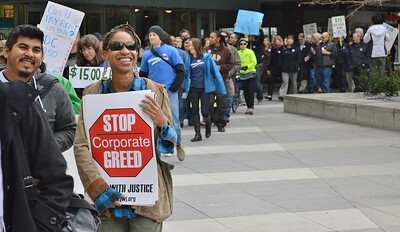 African American woman holding sign about corporate greed, long line of protest marchers with signs stretches out behind her. 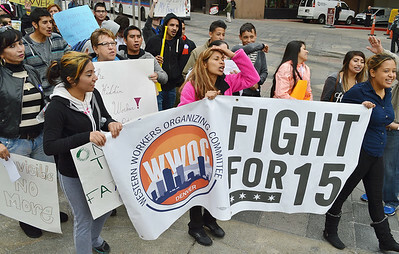 African American man wearing Malcolm X t-shirt, raises fist in the air, large number of protesters marching with signs behind him. 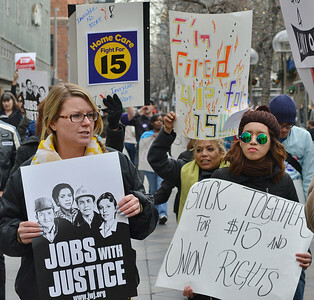 Woman holding "Jobs With Justice" sign, next to her women wearing reflective sunglasses holding sign about $15/hr and union rights, behind them other protesters marching with signs. 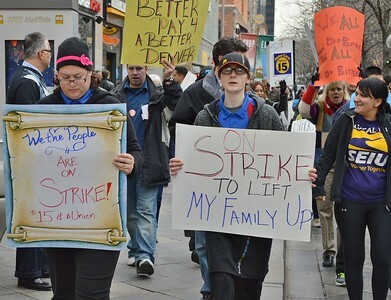 Young man and woman carry signs about better wages and striking, large number og protest marchers behind them. 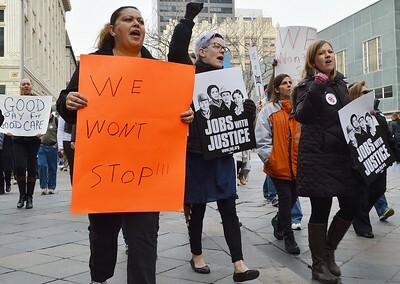 Women marching holding "Jobs With Justice" signs, one raises fist in the air, other demonstrators in the background. 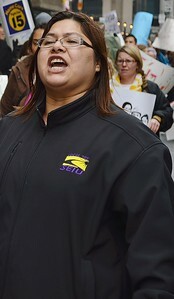 Woman wearing SEIU jacket, shouting, other protestmarchers in the background. 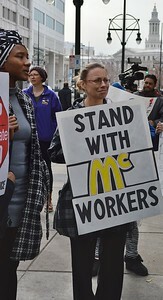 Woman holding sign "Stand With McDonalds Workers". 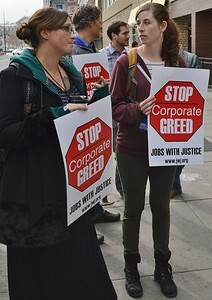 Two women holding signs "Stop Corporate Greed". 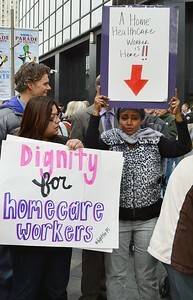 Woman raises sign over her head "Dignity For Homecare Workers" other protesters marching behind her. 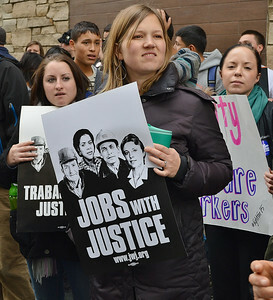 Young woman holding "Jobs With Justice" sign, other demonstrators in background. 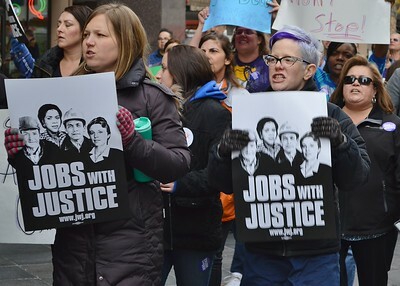 Two women marching with "Jobs With Justice" sign, one with purple hair, large group of protesters in the background. 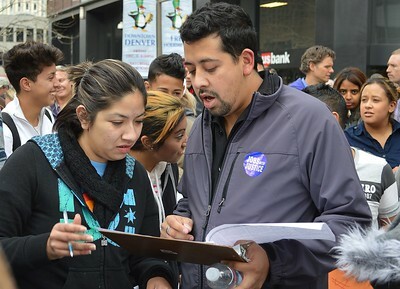 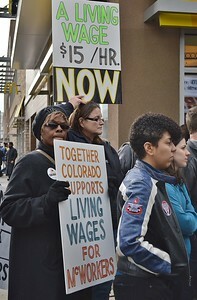 African American woman holding sign "Together Colorado Supports McDonalds Workers", behind her woman with sign about $15/hr wage. 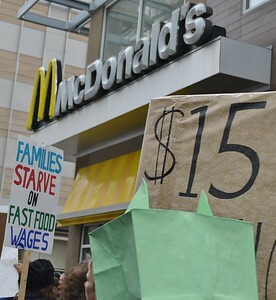 Group of protesters with signs about better wages for fast food workers, above the a McDonald with "Golden Arches" logo. 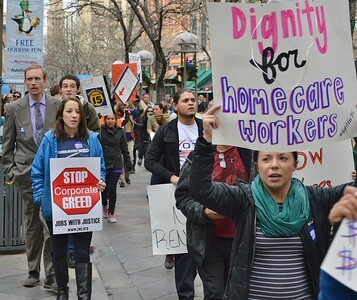 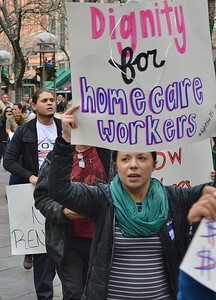 Two women holding signs about home health care workers. 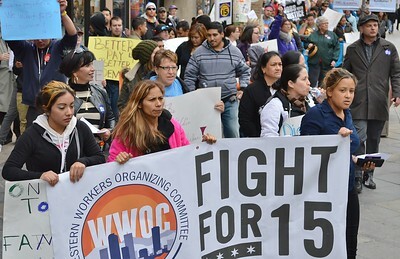 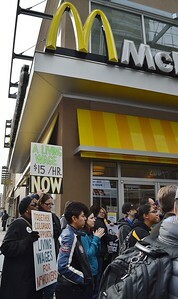 Protest signs about low wages for fast food workers, McDonalds "Golden Arches" above them.